Let me start off by saying that this is not a post about debugging serverless with OpenWhisk. I want to write something up on that at a good high/broad level. Rather I want to share a quick example since something I wrote broke recently and I thought it would be a good “real world” use case of something going wrong, how I looked into it, and how I corrected it. 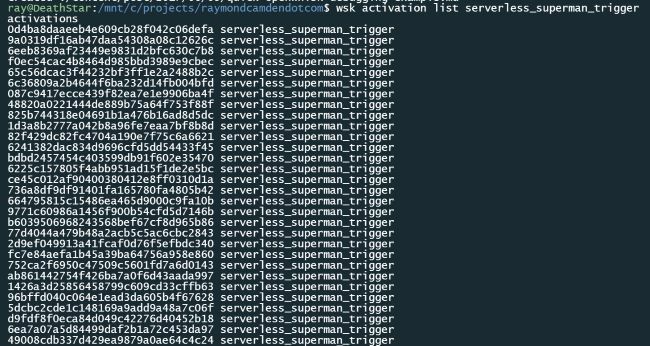 I think debugging/monitoring is one of the most crucial aspects of a serverless platform, and something OpenWhisk itself needs some help on, but again, I’ll save that for a later post. If by “great” we mean silly and pointless of course. So, what went wrong? First - I noticed something was wrong when I didn’t see Serverless Superman in my “serverless” search column in my Twitter client. I had set it up to tweet once every ten minutes (assuming it could find a tweet in the past ten minutes) and after looking at the account’s Twitter page, I noted it had been quiet for a few days. Unfortunately, OpenWhisk doesn’t (currently) support any way to let you know if an action is having problems, and I have some thoughts on that, but as I said in the beginning, I’ll discuss that more later. So at this point, I need to had to figure out what went wrong. My app only used two services - OpenWhisk and Twitter. It is absolutely reasonable to think that Twitter could be down (it happens), but as I was looking at a few days of downtime (and I could visually verify Twitter was working) I knew that wasn’t the case. Right away I see the trigger was a success, but I wasn’t really concerned about it being successful. Literally all it has to do is run to be a success. What I needed was the time it ran. Unfortunately this is returned in a “seconds since epoch” format. I hopped over to EpochConverter to get a real value. As a quick aside, if you actually do that for the sample above it will report a time from today, well “today” being relative to when I wrote this blog entry. Obviously the activations I was worried about were back when the thing died, and was dead. The important thing to note is that it was “current”, in other words, some value in the past ten minutes. Ok, so the trigger is fine. To be honest, I hate working with CRON as the syntax confuses the heck out of me, and that’s why I wanted to ensure it was still firing. As another quick aside, dotweet is actually in a package, but it is kind of a pain right now to filter by package/action. I got the most recent activation, and voila - my issue! "message": "Application cannot perform write actions. Contact Twitter Platform Operations through https://support.twitter. As you can see above, Twitter was blocking my account from Tweeting. I logged onto the site, checked the developer portal, and saw that - yep - I was being blocked. Unfortunately Twitter wasn’t very verbose about why I was blocked. I guessed that maybe I was simply tweeting too much. I filled out the “I’m sorry” form (not really called that) and was surprised to see I got a response within ten minutes. My app was re-enabled and all I had to do was update my trigger with a new schedule (now once every 30 minutes). Ok, so, as I said, that’s just an example of how I debugged an issue and got to my fix. I’ll be blogging about this topic more later in the month as I wrap my head around the issue a bit deeper. As always, I’m curious what folks think, what their experience is with debugging serverless apps, and any questions they may have. Just drop me a comment below!